Go nonstop for days on a single charge.² The wireless charger lets you power up without slowing down. The Galaxy Watch takes on life with military-grade durability,³ swim-ready water resistance⁴ and Corning Gorilla Glass DX+ that prevents the display from getting scratched. Available in two sizes and three colors, the Galaxy Watch offers stylish watch faces so realistic they hardly look digital. Plus, choose from a collection of interchangeable bands. Even when your phone isn’t in reach,⁵ make and take calls with an integrated speaker and voice mic, respond to texts, and access scores, headlines and playlists. See your appointments as soon as you wake up, then track your activities as the day unfolds. At the end of the day, check your steps plus tomorrow’s schedule and weather. Control all your connected home devices from your wrist even when you’re not home. Plus, get the details of a security camera alert from the SmartThings app on your Galaxy Watch. 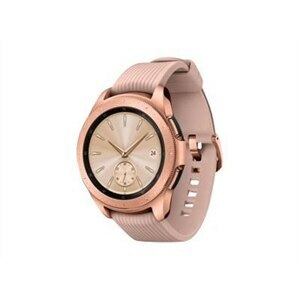 The Galaxy Watch pairs with both Android and iOS smartphones via Bluetooth connection. Galaxy Watch is the smartwatch that helps you stay connected - wherever your day takes you. Galaxy Watch features Bluetooth connectivity and contextual information based on where you are, how you live and how you use your watch.